During this year we will be celebrating the 800th anniversary of the sealing of Magna Carta, otherwise known as the Great Charter. On 15th June 1215 King John reluctantly set out from Windsor Castle to make a pact with a powerful group of rebel Barons at Runnymede. He was greatly outnumbered and in desperation he agreed to their demands to observe the rights, privileges and liberties of the clergy and the nobles. King John's promises were set down in writing and an unknown number of copies of the document, which came to be known as the Magna Carta, were made and distributed across England. Four of the original copies of the Magna Carta survive to this day. 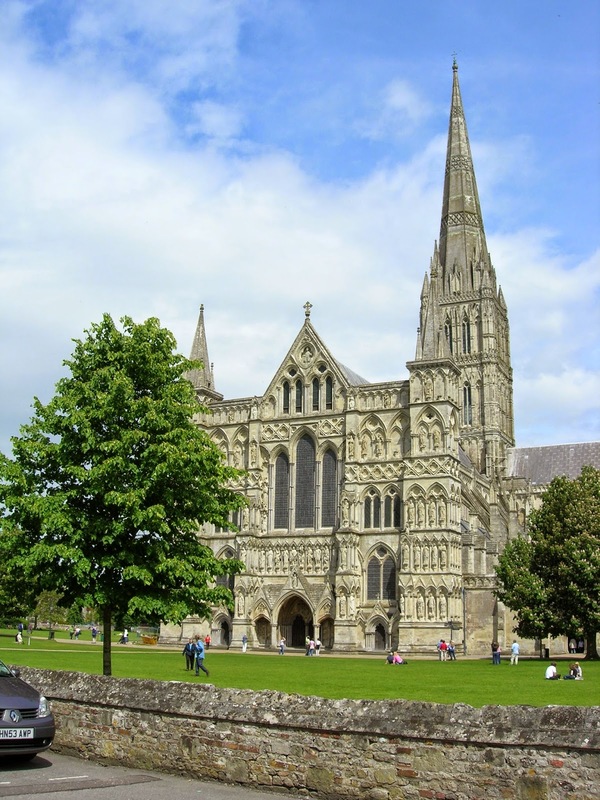 Salisbury Cathedral, pictured on the left, probably has the best preserved version of the document and will be celebrating the anniversary with a new exhibition in their 13th century Chapter House where this very famous and powerful document will be on display. Two copies of the Magna Carta are in the British Library and from 13th March - 1st September they will be part of their exhibition entitled Law, Liberty, Legacy. The fourth copy is held in Lincoln castle. But what about King John? He was probably one of the most unpopular and cruellest of all the Kings of England. He put his seal to the Magna Carta to keep peace with rebel barons but only to buy himself time, he never intended to keep to the Charter. The result was Civil War. The nobility called on Prince Louis of France to invade England to depose the monarch who had become such a tyrant. King John, however proved himself an able soldier and continued to wage war, but a severe attack of dysentery made him very ill and brought on his early and unexpected death at Newark Castle in October 1216, resulting in a divided country. King John's nine year old son, Henry was quickly crowned King Henry III at Gloucester. The crowning of a new English King thwarted Prince Louis' reasons for invading the country, he also lost the support of the rebel barons so returned to France and has more or less been written out of English history ever since. As King John lay dying he made a Will. As part of that Will, John requested: "I will that my body be buried in the church of St. Mary and St. Wulfstan of Worcester". Amazingly, the document still exists, and is on display in Worcester Cathedral's library. King John's final request was to be buried between two saints - St Oswald and St Wulfstan and here is the tomb, pictured on the left, with his marble effigy lying on top and either side of his head are carvings of the two saints. Worcester Cathedral will be marking the 800th anniversary with an exhibition - King John, Magna Carta and Worcester Cathedral until December 2016. There will be pre-booked talks, lectures and concerts during 2015 and a Shakespeare play - King John in the Cathedral in October 2016 to coincide with the anniversary of his death.